Rehearsals are held at the EJD Middle School (Phoenix), located on Volney Street (Route 264) at the north end of the village of Phoenix, New York. 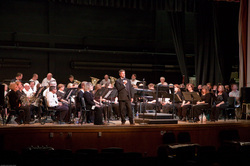 Rehearsals are in the band room at the rear of the school; access to the building from the large, north parking lot is provided. Rehearsals are on Monday evenings. We officially start at 6:45, try to arrive by 6:30 to allow time to set up, warm up, and for announcements. We try to end by 8:45, but don't hold us to that! If the school is closed or if after-school activities are cancelled on a Monday due to a holiday, weather, or for any reason, we will practice on Tuesday evening at the same time and place, unless school is closed on Tuesday as well. Should that occur, that week’s rehearsal is cancelled. In the event of non-holiday closures, we try to have an announcement posted on TV channel 3 cancellations in a timely manner.